Rare things cost more. And few things are more rare than a legitimate NFL starting quarterback. In terms of NFL starting quarterbacks, Dak Prescott is the greatest bargain in the league. With salaries for the most crucial position in the game soaring, he is playing for the Dallas Cowboys on a fourth-round rookie deal that is the equivalent of pocket change. While there have been other late-round success stories like Tom Brady, and the Cowboys had UDFA Tony Romo become their starter, Prescott may be unique in that he has been the starter from the first game of his career despite being such a late pick. Having him puts his team in very good shape in a division where the other three teams have various issues with the position. He is unquestionably underpaid, and at some point, perhaps this offseason, that is going to change. Prescott’s career, during which Dallas has gone 33-18, has won many over. But with the struggles in the latter half of 2017 and limited playoff success not all are convinced. Complicating things are the other star players the Cowboys are going to have to pay soon. There was a question raised by Bryan Broaddus of DallasCowboys.com about that. If you go to Twitter and read the replies to that, there are a lot who think Prescott is the guy you leave out in the cold. Allow me to present the argument as to why that would be a mistake. An NFL quarterback who can lead his team to wins in 65% of the games he plays is a precious commodity in a league where we just saw a season open with Blaine Gabbert, Sam Bradford, Joe Flacco, Eli Manning, Ryan Tannehill, Tyrod Taylor, Case Keenum, Andy Dalton, Blake Bortles, and Ryan Fitzpatrick all starting for their teams. It is a simple fact that there are not enough legitimate starting quarterbacks for each of the 32 teams to have one. Based on how he performed this year, there is not much of a basis to argue Prescott was not better than all of the players listed above. Where he ranks among the remaining 20 starters is open for debate, but saying he does not belong among them is just ignoring facts, data, and logic. 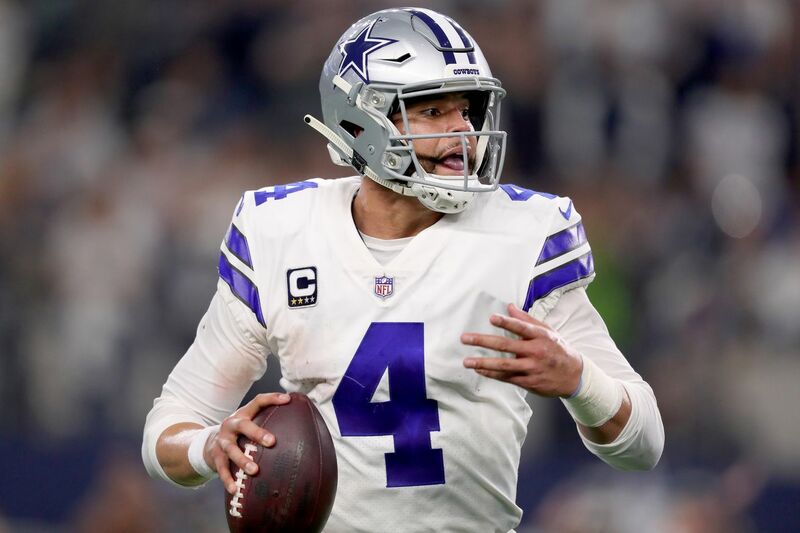 Prescott’s own history is seen by some as an argument that you don’t have to spend a lot of capital, either high draft picks or free agent cap costs, to get a true starter at the position. Brady and Romo also are used as examples. That completely disregards just how rare they are. Most successful starting quarterbacks cost a first-round pick, usually a high one. And the success rate for those is alarmingly inconsistent. While 2018 may turn out to have been a banner year for first round QBs, the verdict is hardly final. Let’s go back to 2016 as a starting point, so we are able to look at only those who have three or more seasons of history since being selected, and consider all the first-round QBs taken since 2010. That list includes Paxton Lynch (a bullet accidentally dodged by Dallas), Bortles, Johnny Manziel (another somewhat near miss for the Cowboys, although not nearly as close as some in the media will tell you), E.J. Manuel, Tannehill, Brandon Weeden (who we saw up close and personal, but for negligible cost), Jake Locker, Gabbert, Christian Ponder, Bradford, and Tim Tebow. The real message here is that there is no reliable pipeline of NFL quarterbacks. Some years produce multiple starters. Others are total busts. A team cannot just go into the draft with the expectation they will grab their future starter and all will be well, especially without a high pick or the ability to trade up into the first five spots. It is indeed rare that a team goes from one elite quarterback to another, the way Aaron Rodgers succeeded Brett Favre, or Andrew Luck came in behind Peyton Manning. More often, teams wind up taking a step back - sometimes off a cliff. Add in that to even get a realistic shot at a top-level QB usually means having to tank in effect, or invest huge amounts of free agent money with similar levels of risk (see the example of Alex Smith) and it is obvious just how difficult acquiring a true starter is. Interesting discussion. But in a league where Jimmy Garoppolo got $27.5 per year on a five-year, $137.5 million deal, you’ve got to believe in unicorns if you think Prescott will get anything less. In April 2017, the Lions signed Matt Stafford to a five-year, $135 million deal ($27m/year). In February 2018, the 49ers gave Jimmy Garoppolo a five-year deal worth $137.5 million ($27.5m/year). In March 2018, Kirk Cousins signed in Minnesota for $84 million for three years ($28m/year). In May 2018, the Falcons signed Matt Ryan to a 5-year, $150 million deal ($30m/year). In August 2018, the Packers extended Aaron Rodgers for four years and $134 million ($33.5m/year). Prescott’s contract will be nowhere close to $25 million per year. The Cowboys will be lucky to get him below $30 million, but his agent is going to push for a contract above $30 million. He won’t get Rodgers money, but he’s going to want more than Ryan. I don’t see much to argue with there. The team may want to shoot for the $31 to $32 million range with Prescott, but you can clearly see the trend. There is an argument to be made that he has not proven himself to the degree that Rodgers and Ryan have - but Stafford, Garoppolo and Cousins haven’t, either, and their deals were pushing the ceiling up when they were done. Also consider that the recent tumult in the offensive coaching staff is an argument that Prescott was being held back under Scott Linehan. Now the team has gone all in to help him reach his perceived potential with Kellen Moore’s promotion and the hiring of Jon Kitna. That looks like a pretty good indication that they are willing to put a lot of money into his next deal as well. Further, the way the trend is clearly going means that getting a new contract done now will save them money in the long run, before other teams push that envelope even more. So brace yourselves. It is entirely feasible that Prescott’s second contract will set a new record, perhaps pushing to the $35 million per year level. The precedent certainly exists. And it may be worth every penny.